Dr. Alfred Jenkins is a board certified gynecologic oncologist who received his Doctor of Medicine in 1997 from the University of South Carolina School of Medicine. He completed his residency at the University of South Carolina and his fellowship at the University of Texas, M.D. Anderson Cancer Center in the Department of Gynecologic Oncology. Dr. Jenkins was previously a director and instructor in the division of gynecologic oncology at the Orlando Regional Medical Center while he worked at M.D. Anderson Cancer Center of Orlando. He then became a clinical instructor at the Emory School of Medicine while working at Piedmont Gynecologic Oncology. Dr. Jenkins has been published in Gynecologic Oncology and the International Journal of Oncology and is recognized for his expertise in advanced laparoscopy and robotic surgery. 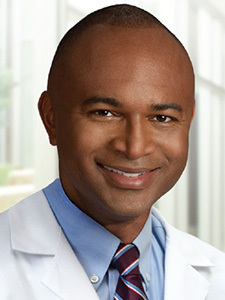 Dr. Jenkins is certified by MD Anderson Cancer Network®, a program of MD Anderson Cancer Center.